The recent post about the story of Intrepid to print made me think. I sometimes assume that as we’re all designers and publishers we all know all we need about the subject. I’ve self published stuff but I still learnt from John’s experiences. I talked about Critters and the Critter Pool in a previous blog entry. But as awesome as the Critter Pool is, one may not always have 40-50 multi-coloured six sided dice with which to play. This is where the The Critter Pool Machine comes handy. The encounters are scaled to the number of Bounty Hunters. For a normal encounter you can expect a critter for each Bounty Hunter though there could be a few more or a few less. The Easy and Hard options further skews the odds towards fewer or more critters respectively. As for the critters themselves, you can choose which you want from the list of 25, let the application choose randomly of just enter your own critter name and description. That’s about all there is to it. 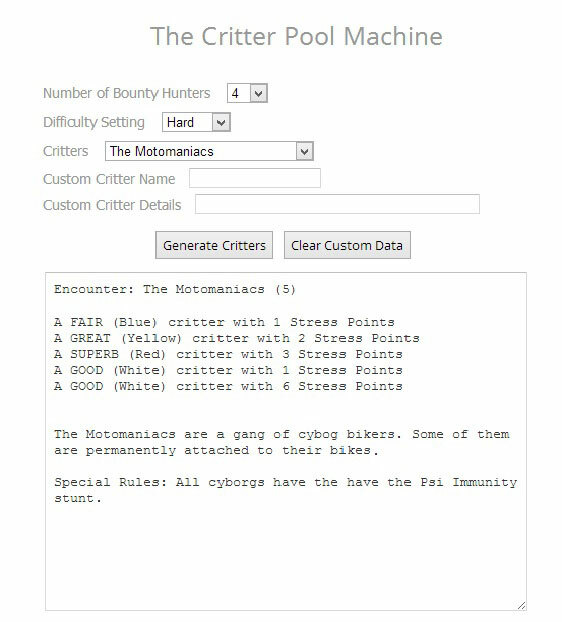 Oh, one last thing, here is the link to the Critter Pool Machine itself. Enjoy!